So, I’m sure if you have been following our social media at all, you know that Visual Novel Maker is a thing and that it is now out. 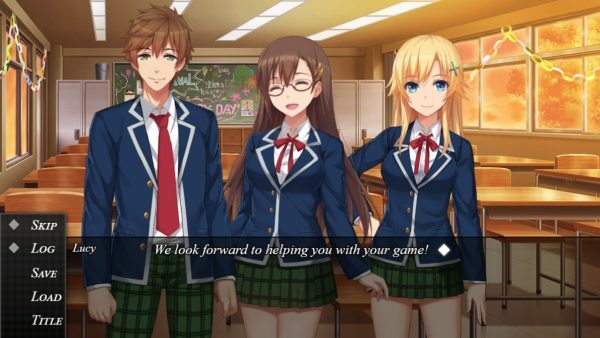 Visual Novel Maker isn’t the first Visual Novel Engine, but we do think it is the best. Visual Novel Maker is made to be as easy to use as possible while retaining all the power you could ever need. Whether you are just making your first visual novel, or you’ve made eighty already, we’re sure that Visual Novel Maker can make your game dev faster and better. But today, I’m going to focus on the two things that make the Engine perfect for newbies. The core of Visual Novel Maker is the very easy to use drag and drop scene editor. Just drop in the commands you want and go. These commands will let you do just about anything you can imagine a visual novel should do, add people to the scene, have them talk, move the camera around, branching paths, keeping track of how much certain characters like/dislike you… Pretty much if you can dream it, with just a little understanding of eventing logic, you can make it. Prefer to type in your commands? Visual Novel Maker allows you to do that as well. And if you can’t draw? Visual Novel Maker is the only visual novel engine that comes with built-in art for you to use! Backgrounds, characters, music, sound effects. Included in the purchase of Visual Novel Maker is a high school setting, plus fantasy characters as well. In the future, you’ll be able to pick up even more resources as DLC! And even if you can make all your own art, these pieces make fantastic placeholders so you can jump in on the dev work right away! So take a look at Visual Novel Maker on Steam! Next post: The Steam Winter Sale is here, Curl up at the fire with a good mystery! The Official DegiGames Blog » Feature » Why Visual Novel Maker?